If you are looking for a free disk encryption program then you can try out FreeOTFE. FreeOTFE is an open source utility which can be used for “on-the-fly” transparent disk encryption of your data. FreeOTFE is available for both PCs and PDAs. 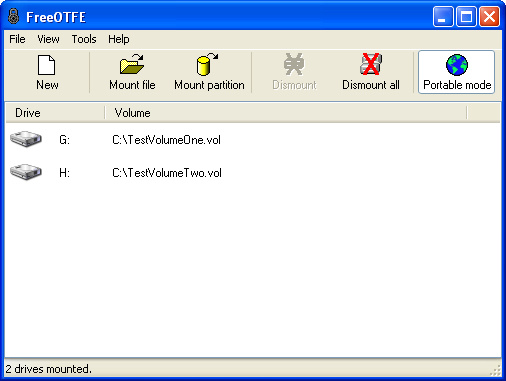 FreeOTFE can be used to create one or more “virtual disks” on your computer. These disks operate exactly like a normal disk except that any data written on to them is transparently and securely encrypted before being stored on your computer’s hard drive. FreeOTFE will be very useful when you have some secure data on your disk. FreeOTFE supports many hash and encryption algorithms, and provides a greater level of flexibility. You can easily create a new volume and store your encrypted data. You can mount the new volume and it is displayed as a new drive. So next time when you save any data in the disk the data is encrypted automatically. The encryption and decryption of data is carried out transparently. To secure your data just dismount the virtual drive that you have created. Open source and source code is freely available. Includes Hash algorithms like MD5, SHA-512, RIPEMD-160, Tiger and many more. Cyphers include AES (256 bit), Twofish (256 bit), Blowfish (448 bit), Serpent (256 bit). XTS, LRW and CBC (including XTS-AES-128 and XTS-AES-256) Cypher modes are supported. Supports password salting (up to 512 bits) which reduces the risks of dictionary attacks. Supports very large volumes and files up to 2^63 bytes (8388608 TB). This is nice freeware. Thanks for the information.